WASHINGTON — Sen. Bernie Sanders, I-Vt., has formally declared himself a member of the Democratic Party as he seeks its presidential nomination in 2020, abiding by new Democratic National Committee rules. "I am a member of the Democratic Party," reads the statement to the DNC that Sanders signed and notarized Tuesday. It also asserts that Sanders will serve as a Democrat if elected president and that the DNC can determine who is "a bonafide Democrat." 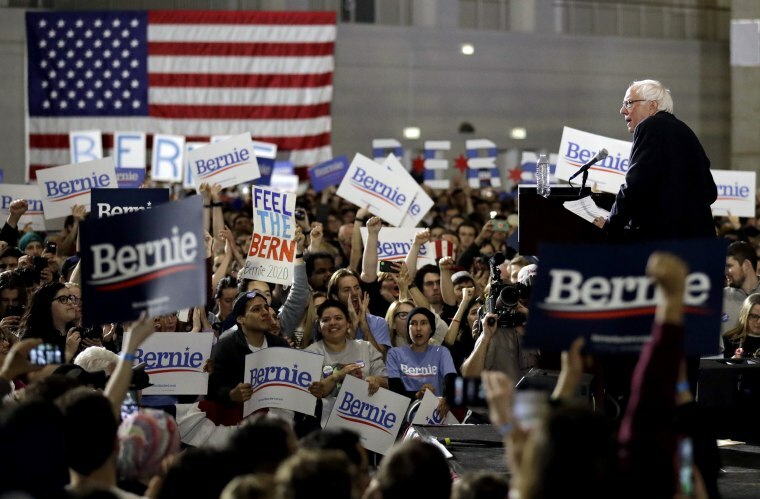 Sanders, a political independent who caucuses with Democrats in the Senate, has long resisted calls to formally join the Democratic Party, which continues to be a sore spot for mainline Democrats skeptical of the self-described Democratic socialist. As the DNC prepared the rules for the 2020 nominating contest, it sought to clarify its membership requirements — over Sanders allies' vocal objections — by requiring every presidential candidate to sign the loyalty pledge. The party sent all declared candidates the form last Wednesday and Thursday and they have one week to return it signed, according to a DNC spokesperson. But even now, the depth and permanence of Sanders' commitment to the party remains murky. On Monday, Sanders filed paperwork to run for reelection to the Senate in 2024 — but as an independent. That's the same affiliation he ran on last year when he won another six-year term representing Vermont. When Sanders ran for president in 2016, there was some question about whether he would qualify for the ballot in New Hampshire, home to the first-in-the-nation presidential primary, because state law requires candidates to be a member of the party they're seeking to represent in the general election. The chairman of the state Democratic party personally accompanied Sanders to the secretary of state's office to vouch for him and make sure the candidate would get on the ballot. "I am the longest-serving independent in the history of the United States Congress. That’s how the people of Vermont sent me to Washington and I'm proud of that," Sanders told reporters after filing for his paperwork in New Hampshire in late 2015. "And I had to make a decision six months ago. Do I run as a Democrat or do I run as an Independent? And I made that decision. I am running as a Democrat, obviously. I am a Democrat now." A reporter followed up by asking if Sanders would run in all potential future elections as a Democrat and Sanders replied, "Yes." His closest aide, then-campaign manager Jeff Weaver, reiterated that sentiment later in an interview when asked if Sanders was a member of the party for life. But since his first bid for mayor of Burlington, Sanders has always run for office as an independent in Vermont. In fact, as mayor, he fought an extended battle with Democrats on the City Council, who sought to thwart him at every turn and win back a seat they felt was rightfully theirs. He won that fight in Burlington by getting allies to run on a new third party, the Progressive Party, which has since become a powerful force in Vermont politics. But Sanders has declined to join even that party, which he had a hand in creating, preferring always to maintain his independence. For years, he has been the de-facto Democratic nominee for the Senate, with party leaders offering their support and discouraging self-declared Democrats from challenging him. Moreover, Vermont is one of a handful of states where voters do not register by party and can participate in any primary they wish, so Sanders has never had to officially declare his personal partisan membership.